My older brother Sam is an avid toy collector and a big kid at heart. His playful nature was transformed four years ago when his daughter Tziona was born. Over the years, I have watched him evolve into an overly patient and doting father; the ultimate play partner for a child and a wonderful parent. Sam has learned to listen carefully to his daughters needs and caters to her strengths and challenges. Watching them interact with one another, you can feel the love and attention. Tziona was born with mild cerebral palsy and as a result struggles with her gross and fine motor skills. At an early age, Tziona’s physical therapist suggested that she build with LEGO as a way to improve her coordination. As she learned to follow more complicated instructions and follow pictorial diagrams, building with LEGO was an activity that she and her father enjoyed playing together. As you may imagine, asking a toddler to comply with therapeutic exercises and activities can be difficult and draining but playing with LEGO is an activity she looks forward to everyday. Tziona is a bright and inquisitive girl, with large expressive eyes she often challenges her father to create custom building sets. It seems that she too shares her father’s creativity and interest in thinking outside of the box. 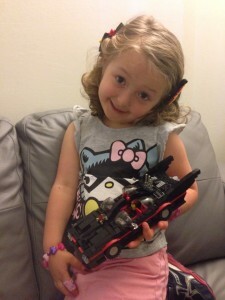 One day, Tziona raised a concern to her father regarding an apparent injustice in the traditional Lego Batmobile; “Why is there no room for Robin to ride along with Batman?” she wondered. She charged her personal super-hero with the task of creating a Lego Batmobile which allowed Robin a space in the car to accompany Batman on their crime fighting adventures. Naturally, Sam took the request quite seriously and immediately began planning. Sam felt that it was only fitting for his daughter to have the iconic 1966 model, driven by the great Adam West and designed by the talented George Barris. With it’s clean lines and memorable red pin-stripe, Tziona was instantly smitten! Sam’s creative talents have long been recognized by his friends and family. We often encourage him to share his creativity at a larger scale. When we saw his newest creation we urged him to do something with it. After doing some research, Sam submitted the design to an ongoing contest posted on ‘LEGO Ideas’ an official LEGO site. If he receives 10,000 supporters LEGO will consider putting it into production! Yes, Sam will undoubtedly be personally thrilled to reach this goal as a form of appreciation for his work, but ultimately a vote for this project is a vote for an incredible Daddy-Daughter team that greets the road of life seated side by side.